Kucinich’s Domestic Policy Subcommittee held five joint hearing on the matter with the Oversight and Government Reform Committee. 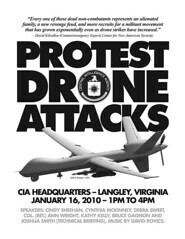 Long-time anti-war activist Cindy Sheehan is now speaking out against drone activities in Pakistan. She sat down with Kristine Frazao to talk about how extrajudicial CIA actions are mostly affecting civilians in remote tribal regions. Every week Max Keiser looks at all the scandal behind the financial news headlines. This week Max Keiser and co-host, Stacy Herbert, talk about Geithner’s AIG shenanigans, Goldman’s 259% bonuses and the teamsters defeat of Goldman Sachs. Keiser also speaks to Birgitta Jonsdottir, leader of The Movement in the Icelandic Parliament, who is taking on the international bankers. No matter how badly off we are (or are not), here in the U.S., we have it much better than the people in the poorest nation in our hemisphere. Please be as generous as you can. Cindy Sheehan’s Soapbox is pleased that the crisis in Haiti is getting so much corporate and other media attention, but the U.S. is creating other humanitarian disasters in the Middle East, Afghanistan and Pakistan. Zbigniew Brzezinski is a Polish-American political scientist, geostrategist, and statesman who served as United States National Security Advisor to President Jimmy Carter from 1977 to 1981. Known for his hawkish foreign policy at a time when the Democratic Party was increasingly dovish, he is a foreign policy “realist”.